Philip is a good boy, a really good boy, who accidentally gets sent to Hell to become the Devil’s heir. The Devil, Lucifer, is dying and desperately in need of a successor, but there’s been a mistake and Philip is the wrong boy. Philip is terrible at being bad, but Lucifer has no other choice than to begin the difficult task of training him in the ways of evil. Philip gets Philip is a good boy, a really good boy, who accidentally gets sent to Hell to become the Devil’s heir. The Devil, Lucifer, is dying and desperately in need of a successor, but there’s been a mistake and Philip is the wrong boy. Philip is terrible at being bad, but Lucifer has no other choice than to begin the difficult task of training him in the ways of evil. Philip gets both friends and enemies in this odd, gloomy underworld—but who can he trust, when he discovers an evil-minded plot against the dark throne? To ask other readers questions about The Devil's Apprentice, please sign up. I was lucky enough to receive the first two books of The Great Devil War Series by the author himself. 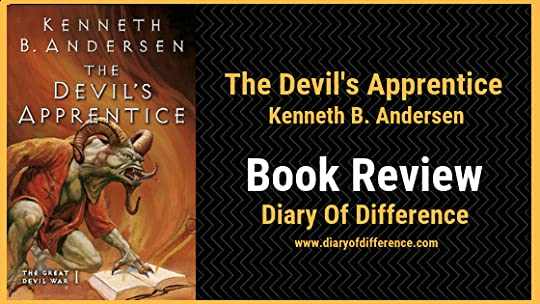 I haven’t heard about Kenneth B. Andersen before, but after reading the synopsis, I knew I had to have these books - I knew I had to read the whole series. Meet Phillip - he is a good boy. An angel. He helps his mum with the chores, he helps his friends with their homework, he loves and takes care of animals, and he never lies. But one day, he is sent to Hell by mistake, and he has to become the Devil’s Apprentice. The Devil is ill and before he dies he has to make sure to teach Phillip the worst tricks in Hell’s history, and teach him to be evil - but Phillip is simply terrible at being bad and keeps failing all his tests. I loved this book so much! The best thing about it is the setting. We enter a world and we get to see Hell through Phillip’s eyes. Everyone has their own place and role, there is a system of how they designate people and where they go - we meet Death and see the process of how he chooses who dies, and how they place people in either Heaven or Hell, depending on the actions people take throughout their lives, and also, how the Devil throws the dice as well. I am so glad I have read this book, and I can’t wait to read the second book. If you enjoy Young-Adult fantasy, and if you even enjoyed Dante’s Inferno, this book will probably be something you might enjoy. It will make you giggle, and even make you wonder, and it will leave you restless with all the adventures, page after page. I understand why so many are up in arms about this book, why they are flailing over KBA's world. My only regret is not reading it sooner, because it was great. So great. I will definitely be continuing this series and immediately! Bogen har en helt forrygende og sjov humor. Jeg grinede højt flere gange, dog synes jeg den mister lidt af flowet til sidst. Men generelt var jeg godt underholdt det meste af tiden. Historien er lyttet som lydbog og jeg var meget imponeret over forfatterens behagelige og helt perfekte oplæsning. If you like Dennis Jürgensen, then this is a must read book, as it's universe is very similar to that of this other author. An epic and fun journey into the depths of hell and the soul of humankind. Virkelig virkelig god bog! fantastisk skrevet og et rigtig godt plot! endelig er der en forfatter der tør tage en ind i selveste helvede! dette er en oplevelse man ikke må gå glip af! Sikke en god roman! Den er helt klart den mest sjove i serien, da de andre bøger er ret mørke, og ikk lige så mange lyse øjeblikke. Fillips rejse som djævelens lærling, bragte mange gode minder, fra da jeg læste sen første gang. Man skal virkelig nyde dem, fordi hvis man ikke stopper, i fornuftig tid, kan man ikke stoppe! Det var også meget sjovt at genopdage sjo små detaljer om verden, da de ikke er så vigtige, men samtidig er. Jedna z tých veľmi fajn YA fantasy, ktorým to človek rád uverí - funkčný a premyslený alternatívny svet, uveriteľné postavy, napínavá zápletka, prirodzené dialógy, vtipné momenty... čítalo sa to veľmi dobre, prekladá skvele. Už teraz sa vyslovene teším na ďalšie diely. This is a fun book. Written in the third-person form the point of view of Philip, a thirteen-year-old boy who lives with his mother and who lost his father when he was very young, this novel is suitable for younger readers and also for adults. I I am writing this review as a member of Rosie’s Book Review Team (authors, if you’re looking for reviews, I recommend you check her amazing site here), and I thank her and the author for providing me an ARC copy of this book that I freely chose to review. Phillip is probably one of the most good hearted boys ever. Not as in, you really want to strangle him, because he's just too good. He's just the kind of boy you would like as your friend. By a twist of fate he ends up in Hell as the Devil's apprentice. This causes Lucifer no end of grief, because a boy as good hearted as Phillip, really is ill suited to become the next Master of Hell. I enjoyed the world building, the different ways of punishing the sinners in Hell and how he incorporated Phillip is probably one of the most good hearted boys ever. Not as in, you really want to strangle him, because he's just too good. I enjoyed the world building, the different ways of punishing the sinners in Hell and how he incorporated the biblical elements. It opened up for some very good conversations with my son. Jeg ved godt at denne bog er til et lidt yngre publikum men jeg elsker at følge med i hvad der sker i den målgruppes bøger så jeg kan hjælpe mine søskende med at finde gode bøger. Kenneth Bøgh Andersen er en super god forfatter. Han skriver nogle gode bøger som fanger læseren og som kan tages ind på flere niveauer. Har læst den her op for min 8 årige søster, og hun elskede den; og vi havde en lang snak bagefter om hvad den handlede om - det var sjovt at høre hvordan hun havde forstået den og tag Jeg ved godt at denne bog er til et lidt yngre publikum men jeg elsker at følge med i hvad der sker i den målgruppes bøger så jeg kan hjælpe mine søskende med at finde gode bøger. Kenneth Bøgh Andersen er en super god forfatter. Han skriver nogle gode bøger som fanger læseren og som kan tages ind på flere niveauer. Har læst den her op for min 8 årige søster, og hun elskede den; og vi havde en lang snak bagefter om hvad den handlede om - det var sjovt at høre hvordan hun havde forstået den og taget den ind meget mere ordret end jeg havde. Tro vi begge lærte noget af at høre hvad den anden havde fået ud af bogen. A refreshing and humorous Fantasy book about a well-behaved boy, who ends up in Hell by mistake to become the apprentice of Lucifer. A high-concept story with lots of action and great scenes. The logic is somewhat flawed and the mystery doesn't follow thorugh all the way, but still a very entertaining read - and the sequel is just out! Ah, I cannot believe this is finally out for the world to read! These books have formed a lot of Danish children's reading experiences and makes you undoubtedly love and care for the devil himself. This book is nothing short of brilliant, and I would get my hands on it (and the rest of the series) as fast as possible now that it's been translated into English. This book was awesomely funny! I don't think it has been translated into English, but if it does, make sure you give it a go. Especially if you enjoyed Harry Potter or Percy Jackson and that sort of thing. I'm totally looking forward to the next ones in this series. Super fed og rigtig opfindsomt. "The Devil's Apprentice" is like no other Young Adult book I've read. It takes you directly to the Christian Hell and then makes you think through what exactly Hell is and how and why it works the way it does. It sets Philip, a (very) good boy, who seems to have been sent to Hell through a misunderstanding, a series of challenges where to save Lucifer from death, he has to learn to make the evil choices rather than the good ones. Philip's challenges confront him with a variety of ethical problems, some simple, some not. In the beginning, Philip's goodness blinds him to the choices he should be making but when he's put under pressure, experiencing anger and jealousy and betrayal and just how terribly unfair everything is, other choices open up for him. When he's not being tested, young Philip is out and about making friends and enemies of demons and devils and falling in love with Satina, a young temptress devil who is trying to help him solve the puzzle of why the immortal Lucifer is dying. I liked the fact that the book goes beyond the simple humour of making Hell and inversion of our world - making everything tonight or yesternight rather than today or yesterday, praising demons for behaving even worse than they're expected to, having rotting food as a delicacy - and takes an, often gruesome look, at the nature of endless, pointless, punishment. The longer he is Hell, the less clear right and wrong is to Philip. He is innately good but even good people stumble over some choices, especially when some of the devils and demons around him are so likeable and so welcoming and when he has the opportunity to acquire huge amounts of power. The plot is clever but it's the fearless world-building, underpinned by rigorous subjecting difficult situations to an examination that often seems to pit logic against ethics that sets the book apart. It's hard to imagine "The Devil's Apprentice" getting published in the US, never mind finding its way into school libraries. The US struggled with Harry Potter (not because it constantly pitched decency and courage against power and privilege but because it used witchcraft), what would they make of a YA series that generates sympathy for the Devil? As for having King David in Hell because he arranged the death of the husband of a woman he desired, while the logic is unassailable, my guess is that it's too much of a dog whistle item for American school libraries. The banned book folks would be lubricating their corruption of youth arguments with glee. Philip is a good boy, a really good boy, who accidentally gets sent to Hell to become the Devil’s heir. The Devil, Lucifer, is dying and desperately in need of a successor, but there’s been a mistake and Philip is the wrong boy. Philip is terrible at being bad, but Lucifer has no other choice than to begin the difficult task of training him in the ways of evil. Philip gets both friends and enemies in this odd, gloomy underworld—but who can he trust, when he discovers an evil-minded plot against Philip is a good boy, a really good boy, who accidentally gets sent to Hell to become the Devil’s heir. The Devil, Lucifer, is dying and desperately in need of a successor, but there’s been a mistake and Philip is the wrong boy. Philip is terrible at being bad, but Lucifer has no other choice than to begin the difficult task of training him in the ways of evil. Philip gets both friends and enemies in this odd, gloomy underworld—but who can he trust, when he discovers an evil-minded plot against the dark throne? The Devil's Apprentice is volume 1 in The Great Devil War-series. If you take the Harry Potter books and replace Harry Potter with a sweet boy named Philip, Hogwarts with Hell and Dumbledore with Lucifer aka. The Devil, Father of lies and Prince of darkness! You have The Devil's Apprentice! Book 1 in the Great devil war series! Was a fantastic and fun read - went so many different ways twists and turns - I loved the characters adored Lucifix the cat - This was a really well written story and I enjoyed every page and am looking forward to the 2nd book. I enjoyed the world building, the different ways of punishing the sinners in Hell and how he incorporated the biblical elements. When Lucifer lear I received this book from the author to review and I'm so happy I got that chance. I haven't read a young adult fantasy in a long time and when I read the title of the book I knew I had to read it. Ja to teda za YA nemozem povazovat. A napriek tomu, ze je hrdinom 13. rocny chlapec, kniha je ozaj vhodna iba pre zrelych citatelov. Nedavno som tu davala anotaciu, takze uz len moje dojmy. Nakoniec sa mi to velmi pacilo. Pribeh anjelskeho chlapca, ktory sa ma stat diablovym nasledovnikom bol vcelku nevsedny. Peklo bolo opisane tak, ako som si ho ja kedysi predstavovala :slight_smile: Pacili sa mi vsak rozne postavy a druhy diablov, to, ako sa dobry chlapec predsa len stane neposlusny, a tiez sa m Ja to teda za YA nemozem povazovat. A napriek tomu, ze je hrdinom 13. rocny chlapec, kniha je ozaj vhodna iba pre zrelych citatelov. Nakoniec sa mi to velmi pacilo. Pribeh anjelskeho chlapca, ktory sa ma stat diablovym nasledovnikom bol vcelku nevsedny. Peklo bolo opisane tak, ako som si ho ja kedysi predstavovala :slight_smile: Pacili sa mi vsak rozne postavy a druhy diablov, to, ako sa dobry chlapec predsa len stane neposlusny, a tiez sa mi pacilo, ako Lucifer vysvetlil potrebu zla aj dobra. Ak by bolo iba dobro, neboli by policajti, lekari, poziarnici, zachranari, nebolo by o com pisat v spravach, v novinach, prestali by sme si cenit to dobre a krasne. Hvis du er til lidt spænding/komedie og bibelske referencer, så er denne usædvanlige bog af Kenneth Bøgh Andersen måske noget for dig. Jeg har aldrig selv været den mest religiøse person, men bogen overraskede mig. Man kommer helt til at holde af Djævlen, ja Lucifer selv og hans håndlangere! Faktisk får man et meget anderledes syn på Helvede og hvordan det foregår dernede. Er Djævlen virkelig så slem, som man siger? Det er en interessant historie om en dreng, som ved et uheld havner i Helvede ef Hvis du er til lidt spænding/komedie og bibelske referencer, så er denne usædvanlige bog af Kenneth Bøgh Andersen måske noget for dig. Jeg har aldrig selv været den mest religiøse person, men bogen overraskede mig. Man kommer helt til at holde af Djævlen, ja Lucifer selv og hans håndlangere! Faktisk får man et meget anderledes syn på Helvede og hvordan det foregår dernede. Er Djævlen virkelig så slem, som man siger? "Wie wird man des Teufels Nachfolger, wenn man kein bisschen böse ist?" Der dreizehnjährige Filip Engel hat es nicht leicht: Gutmütig, zuvorkommend, immer brav und ehrlich, wie Filip nun mal ist, ist er das passende Opfer für den Schul-Rowdy Damian, der ihm das Leben sozusagen "zur Hölle" macht. Als er nach einer wiederholten Streiterei von Damian aus Versehen vor ein Auto geschubst wird, wacht Filip auf und stellt erschrocken fest, dass er - ausgerechnet er - in der Hölle gelandet ist. Was "Wie wird man des Teufels Nachfolger, wenn man kein bisschen böse ist?" Als er nach einer wiederholten Streiterei von Damian aus Versehen vor ein Auto geschubst wird, wacht Filip auf und stellt erschrocken fest, dass er - ausgerechnet er - in der Hölle gelandet ist. Was hat er denn nur verbrochen? Der Fürst der Dunkelheit persönlich, Luzifer, klärt ihn auf, dass er an einer unheilbaren Krankheit leidet und dringend einen Nachfolger ausbilden muss. Und eben dieser Nachfolger ist Damian. Damian??? Filip klärt den Fürsten aus, dass er ganz gewiss nicht Damian sei und hier doch ein Irrtum vorliegen muss. Luzifer fällt quasi aus allen Wolken! "Wie lautet dein vollständiger Name?" "Engel", wiederholte Luzifer matt und rieb sich die Stirn. "Ich hätte einen Teufel kriegen sollen und bekomme einen Engel? Verdammt, das sieht nicht gut aus." Aber geschehen ist geschehen und lässt sich nicht mehr rückgängig machen - Filip muss sich nun seiner neuen Aufgabe als Teufelslehrling stellen. Diese entpuppt sich als äußerst kniffelig, wenn man aus tiefstem Herzen kein bisschen böse ist. Außerdem macht Filip eine sehr merkwürdige Entdeckung, was Luzifers Krankheit betrifft. Zusammen mit Satina beginnt er der Sache auf den Grund zu gehen! Kenneth Bøgh Andersen hat einen wunderschönen und sehr fantasiereichen Kinderroman geschaffen, der selbst Erwachsenen während des Lesens ein ständiges Lächeln ins Gesicht zaubert. Der Schreibstil ist sehr angenehm und leicht zu lesen und entspricht daher sehr gut dem empfohlenen Lese-Alter. Die Geschichte sprüht nur so vor Witz und Humor und begeistert von der ersten Seite an. Trotz des für Kinder vielleicht etwas unangenehmen Themas "Hölle" kommt hier beim Lesen kein bitterer Beigeschmack auf. Allerdings sollte man meiner Meinung nach die Altersfreigabe unbedingt beachten, denn die Hölle wird mit all seinen landschaftlichen und charakteristischen Gegebenheiten doch recht ausführlich erklärt und bildlich beschrieben. Dies regt natürlich auch ungemein die Fantasie des Lesers an, was aber meiner Meinung nach nicht als negativ empfunden werden kann. Im Gegenteil, man versinkt quasi in der Geschichte und man fühlt sich die ganze Zeit über als Filips unsichtbarer Begleiter. Man fiebert bei seinen Erlebnissen mit, fröstelt bei den Gedanken an die dunklen Gassen und schüttelt sich bei solch "leckeren" Menüs wie zum Beispiel "Gedämpfte Spinnenbeine mit Schneckensoße" , "Feldermaus mit schwarzer Soße" und "Blutbier" - nur um einige der Leckereien zu nennen, die Filip von der gutmütigen Köchin Ravine serviert bekommt. Die Geschichte beginnt gleich spannend und zu keiner Zeit kommt Langeweile beim lesen auf. Im Gegenteil: Man möchte das Buch nicht mehr aus der Hand legen! Zwar vermutet man recht früh, wer oder was hinter Luzifers mysteriösen Krankheit stecken könnte, aber trotzdem hält das Ende doch noch einige Überraschungen bereit. Filip Engel (schon die Namenswahl lässt einen ständig schmunzeln) ist ein herzensguter Junge, der immer für andere da ist und helfen mag, wo er nur kann. Ein Junge, den man sofort lieb gewinnt und ins Herz schließt. Im Gegenteil zu seinen gleichaltrigen Klassenkameraden, die in ihm eher das "Weichei" sehen. Denn Lügen oder gar Streiche aushecken, das ist für Filip fast ein Ding der Unmöglichkeit und so treibt er den armen Luzifer fast in den Wahnsinn. Es ist eine wahre Freude, dem Unterricht der Teufelei zu folgen, da auch Luzifer trotz seiner Rolle als Fürst der Finsternis sehr sympathisch erscheint. Zwei Charaktere, die unterschiedlicher nicht sein könnten und doch so gut zusammen harmonieren, dass für den Leser wirklich schöne Lesestunden dabei herausspringen. Auch wunderschön dargestellt sind seine jugendlichen, zaghaften Gefühle für die schöne Satina und seine rasende Eifersucht gegenüber dem starken Temptaner Aziel, den er sich gleich an seinem ersten Tag in der Hölle zum größten Feind überhaupt gemacht hat. In Satina scheint Filip zum ersten Mal eine echte Freundin zu finden - und das ausgerechnet in der Hölle! Aber auch die vielen Nebendarsteller sind wunderbar und teilweise sehr amüsant dargestellt und regen die Fantasie des Lesers an, wie zum Beispiel die herzensgute und doch vehemente Köchin Ravina oder der Dämon Motzbart, den Filip immer gerne besucht. Und natürlich Luzifers Helfer, die sprechende Katze Luzifax. Sie alle sorgen für wahrlich heitere Momente. "Die teuflischen Abenteuer des Filip Engel" ist ein wirklich empfehlenswerter Kinder-Fantasy-Roman, der nicht nur Kinderherzen höher schlagen lässt! Ich bin total begeistert von diesem Buch und kann es daher auch allen Erwachsenen empfehlen, die gerne einmal ein schönes Kinderbuch zur Hand nehmen, um ein paar unbeschwerte Lesestunden zu genießen. Ich habe mir wirklich schwer getan, das Buch aus der Hand zu legen und wenn es mir zeitlich möglich gewesen wäre, hätte ich es gerne in einem Rutsch durchgelesen. Eltern rate ich, unbedingt auch die Altersangabe zu beachten. Vom Verlag wurden 11 Jahre angegeben und dies empfinde ich auch als angemessen. Früher sollte es meiner Meinung nach nicht gelesen werden. Fantasy-begeisterte Kinder werden mit diesem Buch gewiss ihren Spaß haben. Filip je slušný hoch, se vším všudy, včetně dělání domácích úkolů, přesto se omylem propadne do Pekel a dostane se do rukou samotného vládce Pekel. Fantasy pro mladé čtenáře, která ale dokáže bavit i starší ročníky, autor píše zajímavě, zábavně, příběh běží a Peklo... Peklo je boží a Lucifer sympaťák. The book "Djævlens Lærling" is about how a good well behaved named Filip dies and ends up in hell as the devil's heir. Lucifer soon realizes that he has got the wrong boy but trains him anyways, he just has to find Filip's dark side. As Filip falls in love with someone he experiences jealousy, which the devil Lucifer quickly makes use of. I really liked this book because it's written in a way that is easy to read and has quite a lot of humor. I would definitely recommend reading it. En fantastisk bog og serie - Kenneth Bøgh Andersen har så sandelig ikke gået fejl i denne serie. Bogen er velskrevet med en god portion humor og ironi. Læser serien for tredje gang og kan kun anbefale den videre til andre at give det et skud. Er netop blevet færdig efter at have læst den halve bog i ét stræk, så har ikke helt nået at fordøje den endnu. Men spændende koncept i forhold til ondskab og godhed, livet og døden. Der kommer nok en mere fyldestgørende anmeldelse senere, men ikke nu. This HAS to be one of my favorites! I LOVE everything about it! I read this YEARS ago when I didn't like reading! After I read it, I needed MORE!!! And that was the start for my reading journey. Hope to do a reread soon!!! In 2000 I published my debut fantasy boo I was born in Denmark on a dark and stormy night in November 1976. I began writing when I was a teenager. My first book was a really awful horror novel titled Nidhug's Slaves. It didn't get published. Luckily. 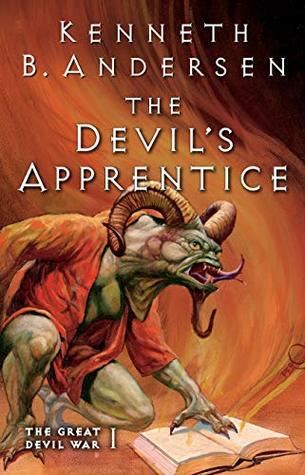 A musical of The Devil's Apprentice opens in the fall 2018 and the movie rights for the series have also been optioned. About THE GREAT DEVIL WAR: The Great Devil War was published in Denmark from 2005-2016, beginning with The Devil's Apprentice. Even though the story (mostly) takes place in Hell and deals with themes like evil, death and free will, it is also a humoristic tale about good and evil seen from a different perspective. A tale that hopefully will make the reader - young or old, boy or girl - laugh and think.